Simple aromatic halogenated organic compounds are very unreactive. Reactivity generally decreases with increased degree of substitution of halogen for hydrogen atoms. Materials in this group are incompatible with strong oxidizing and reducing agents. Also, they are incompatible with many amines, nitrides, azo/diazo compounds, alkali metals, and epoxides. Pentabromodiphenyl ether (PBDE-99) is an amber coloured solid, and insoluble in water. It is a halogenated organic compound and is very unreactive. Reactivity generally decreases with increased degree of substitution of halogen for hydrogen atoms. Materials in this group are incompatible with strong oxidising and reducing agents. Also, they are incompatible with many amines, nitrides, azo/diazo compounds, alkali metals, and epoxides. 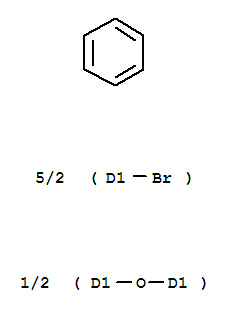 2,2′,4,4′,5-Pentabromodiphenyl ether (PBDE-99) was in use as a component of many commonly used flame retardants, including DE-71, Bromkal G1, and other popular mixtures. DE-71 was sold as a flame retardant for unsaturated polyester, rigid and flexible polyurethane foams, epoxies, laminates, adhesives, and coatings. The PBDEs are used in paint, high-impact plastic, foam, and textiles, as well as in electronic, building, automotive, furniture, and household plastic products. The U.S. manufacturers and the EU have banned the use of PBDE since 2004. Flash point data for Pentabromodiphenyl ether are not available, but Pentabromodiphenyl ether is probably combustible.